Magic the Gathering, a popular card game among the super geeky (not using that as an insult, I love me some geeks) that includes hundreds of unique characters, each with their own background connected to the general lore, has just released a new card with a new character whose story makes it clear that she is, undeniably, a trans woman. This came not long after a writer/designer for MtG answered a question about whether there would be any trans women characters in the near future, to which he simply said "yes." The backstory for Alesha, Who Smiles at Death and is also a huge badass is, well, it's all badass. I'm stealing a big chunk from the lore page on Alesha because who cares, they make tons of money, but also there's a lot more if you want to read it. It had been a day like this, a battle very much like this, when Alesha won the right to name herself. With blood running down her back where the dragon's claws had raked her flesh, she pulled a spear from a dead man's back and plunged it into the beast's mouth, up into its brain. The spear shaft splintered, but the dragon died in an instant. She didn't remember if she had been afraid as the monstrous head lunged at her. What she remembered was the panic that came after. Earning her war name had been her only goal. When the fight was over, she stood silently among the other young ones who were boasting of their accomplishments and the bold, grisly names they would choose. Headsmasher. Skullcleaver. Wingbreaker—Gedruk had been among them. Some of them, mostly orcs, boasted of their ancestors' deeds and spoke of their pride in adopting those ancestors' names. She had been so different—only sixteen, a boy in everyone's eyes but her own, about to choose and declare her name before the khan and all the Mardu. The khan had walked among the warriors, hearing the tales of their glorious deeds. One by one, they declared their new war names, and each time, the khan shouted the names for all to hear. Each time, the horde shouted the name as one, shaking the earth. Then the khan came to Alesha. She stood before him, snakes coiling in the pit of her stomach, and told how she had slain her first dragon. The khan nodded and asked her name. "Alesha," she said, as loudly as she could. Just Alesha, her grandmother's name. "Alesha!" the khan shouted, without a moment's pause. And the whole gathered horde shouted "Alesha!" in reply. The warriors of the Mardu shouted her name. In that moment, if anyone had told her that in three years' time she would be khan, she just might have dared to believe it. Well done, Wizards of the Coast. Representation matters, and you've taken a crucial step in demonstrating that you understand this. 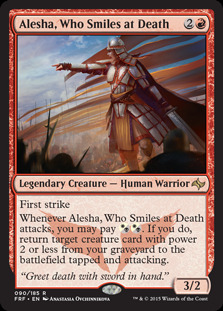 May all my fellow geeks accept all trans women the way the Mardu accepted Alesha.